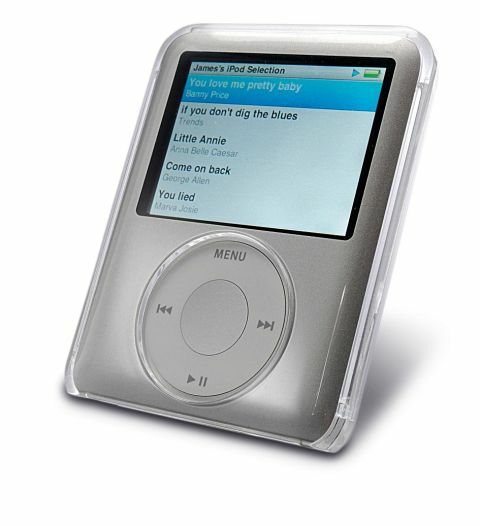 The iClear range of cases from Griffin protects all the current iPods except the shuffle. The designs all incorporate a two-piece cover that snaps closed over the player to protect it from the elements. The Click Wheel and connection slots are left exposed. On the iPod touch, the touch-sensitive front panel is also left exposed. We liked using this design with our third-generation nano; it snaps into place fluidly and continues to show off the nano's good looks. It protects the screen, too. It was easy to control and access the iPod with the case in place. Even the lock button on the iPod was easy to flick back and forth. We didn't notice any heat issues with the design, and it survived various types of abuse. It protected against minor knocks and scratches, but there's no padding here, so don't drop it on the floor as it will jolt the iPod's innards. This is good value for money and you get a few extras in the box, like the static peel screen protector and cleaning cloth. Great stuff.